Taken for a ride: the preferred vendor or the enterprise ? 2 sides of the coin ! The delay had almost cost the business the early mover advantage; they required the solution to be primed within a time window for which they will now have to super stretch. Regulatory deadlines can be unforgiving to business and the Business Head was thus on tenterhooks. He sensed that the wounded ego will not take kindly to the decision; the scorned CFO should have been his ally, after all they had a good working relationship in the past; the CIO was a political outcast with his neutrality now going against him. With a letter of intent the project was kicked off, the contracting took a while; each and every clause was scrutinized and fortified to put the vendor in a precarious situation should the project suffer any kind of deviation. To safeguard his interest, despite undue pressure the vendor did not commit full resources until the paperwork was completed. The business team watched the drama as it played out waiting to get started; the CIO continued to counsel the vendor with a mix of pragmatism and spirit of the now fragile partnership. Starting on perceptibly shaky foundation, the project got off to a fair start with all sides putting in the rigor required to make up lost ground and deliver to promise; review meetings were used for course correction as the steps taken were firm and steady thus covering the halfway milestone with time to spare. The first process prototypes were approved for build and the finishing line appeared to be within reach. Everyone was charged and they were progressing in perfect unison, an example out of the textbooks on project management. Next review meeting had an uninvited yet powerful participant who wanted a personal assessment of the good news that the project reports were portraying. He tested the patience of the team with his questions that attempted to elevate the highly improbable to highly likely even though it did not make any sense to build for probability of events that may occur beyond the six sigma. The system design not addressing the probable though not possible kept recurring as a theme and he declared an emergency by the end of the meeting. No one had anticipated the CFOs active interest in the project considering that after finalization of the contract they had not heard anything from his offices. So the new found interest made everyone a bit uncomfortable, wondering where it was headed. By the end of the meeting it was evident that it was a blatant attempt to derail the project by challenging the team credibility to have thought through the processes and design a solution that addressed all use cases; the team went into a huddle to find a strategy to overcome the new challenge. The vendor provided referenceable material on global best practices and how they had addressed similar scenarios in other markets; the CIO reached out to the subject matter experts to list down occurrences of exceptions over the history of the company rather than work on hypothesis of an eventuality hitting them. All the material thus collated clearly vindicated the stand the team had taken and the solution they had architected which appeared to be adequate to counter the new threat to their project. Such distractions they could do without and they could not have taken on the CFO headlong; so they decided to use the CIOs connections to get an external consultant – an acknowledged authority. As providence would have it, the next meeting was the Steering Committee which had all stakeholders. The Consultant gave an independent critical analysis of the project pointing out a few observations where the team could improve outcomes. The CEO applauded the audit report and endorsed the team to move with full speed. Contracts protect enterprises from external risks, how do we stay protected from internal mischief ? What do you do when your preferred vendor walks away from the deal ? It was a great journey working with you and the team to design the solution; the innovative concept outlined is path-breaking and definitely an industry first. We learned a lot during interactions and refining the architecture; we are thankful for the opportunity. We have discussed the project and debated the immense value it brings both of us with the partnership. Regret, unfortunately we are unable to proceed with the engagement and would like to thank you for offer; we wish you all the best in your future endeavors ! Above is the gist of email received by the CIO from one of the large IT vendors who came up with the best technology solution to the opportunity. It was not a surprise even though collectively they had invested over two man years into the project which had the Board’s blessings as well as eye of the CEO. Just a few months back the leadership team from the vendor had visited them and provided the right messages to the CEO on their commitment to the project; he decided to break the news to the CEO – his manager. The company had lagged behind in some technology solutions that had given an edge to their competitors; not that it made a significant difference, it did score brownie points with customers. Solutions in question were investment intensive and required lot of rigor to sustain; the big players were always competing on such differences in capability. Global competitive benchmark required a multiplier on the investment that none had made in the industry thus far; the company saw this as an opportunity. So the net was cast far and wide to evaluate best in class solutions; the laggard reputation preceding the company did not evince excited responses from the providers. The CIO used all his reputation to nudge them into action, the serious face put forward by the cross-functional team made up for the rest of push required. Activity levels rose through the process reaching a crescendo as they arrived at a well-informed conclusion in an open and transparent assessment to select the best option for their global aspirations. Recommendations were presented to the Management and the Board; everyone acknowledged the thorough nature of the process, metrics and weightage in the calculations. The project was accorded approval with a fair budget and the task shifted to financial negotiations which was not perceived to be a hurdle towards closure. Purchase under the tutelage of the CFO was thus handed over charge of expeditiously moving ahead to keep the momentum going and give the company the much needed impetus towards glory. The shortlisted solution provider recognized the energy infused into the discussions with necessary approvals sought to strike while the iron was hot. With global leadership team’s presence, they reinforced their commitment to the company vision, the project and committed execution with best of resources. After ensuring comprehensiveness of the Bill of Material, terms and conditions, clauses defining inclusions and exclusions, Finance/Purchase and the vendor finally started looking at the numbers and the total cost of ownership. They went back and forth from unreasonable to the outrageous, the game of negotiation began with each attempting to maximize their value. As time passed by, the business team began to feel uneasy on outcome of the protracted exercise which threatened to break up the positivity that prevailed prior to going into the financial discussion. The CEO was dutifully informed of the ongoing progress as the weeks flowed into months; the impasse was now also hurting the vendor who had put their best foot forward. The CIO along with the business head attempted to reconcile to the situation while impressing on the CFO the need to progress; competition had already picked up the ball and started moving in the same direction ! The CFO brushed aside their pleas with the view that he cannot pay more than what he perceived as value for the solution. Business teams withdrew active follow up and left the baby in the lap of IT; the CIO realized that ego had overpowered rationale thought and asked the vendor to decline the business. In the meeting caught unawares, the CEO sought details which the CIO provided in the presence of the Business Head who was not party to the game. An urgent meeting was summoned with Finance, Purchase, Business and IT heads to analyze and find a way to recover the situation. The CFO who was handpicked by the CEO found himself in a compromised situation; he unsuccessfully attempted to shift the blame, finally sheepishly agreeing to recall the vendor and accept their last provided offer to move ahead. Old proverb “Silence is golden” does not apply to the corporate world ! He was much sought after due to his position in the industry built over a period of time with credible success across his stints in various industries. The companies he collected were big brands that added value to partners who provided solutions and basked in reflected glory. The industry loved him for his articulate style and ability to engage in discussions across a wide range of subjects. Oft quoted and a frequent speaker, he build a brand for himself which also brought him accolades internally and externally. People reached out to him to seek advice, listen to his lateral thoughts, introduce new ideas and solutions, bounce off theories and hypothesis, new startup pitches; the flood of requests ensured that his time was always packed from dawn to dusk. His Assistant acted as a gatekeeper to whatever extent she could, a task made difficult because of his popularity and direct access that he allowed to many. He always responded back to cold calls, unsolicited emails, or requests received through the peer network. It did not matter whether the company was big or small or a startup, same applied to whether the solution was relevant to his industry and company; he empathized with the troops of sales people who were always in a spot when attempting to approach CXOs. He gave them half an hour to present their pitch, listened and gave them candid feedback on applicability of their wares to his company and industry. He was approachable but at the same time maintained professional distance in his dealings. She was always busy and rarely had time for anyone – internally or externally; her career of similar length had been built without any fanfare or evidence of noticeable contribution. And then suddenly she was in a position of high visibility which required her to connect across levels and participate in industry gatherings to represent the company’s interests. Speculation was rife on her rise while her past remained a mystery, in the position she now occupied she was expected to learn the ropes and hit the ground running. Business leaders within her company sought her audience to discuss new opportunities, solutions to existing problems, solve operational challenges faced with her team; she was always accompanied by another team member who was left to field the questions and face the heat while half way into the meeting she would disappear as the phone rang. It is not that she did not have the expertise required for her function, her colleagues realized that her unorganized way of working resulted in double booking and general chaos. Vendors, partners and solution providers too did not have any success, she was reluctant to meet with them and whenever she did, they met with similar fate ! She rescheduled or canceled meetings at the last moment, or she would turn up late to the meeting and then again excuse herself with the phone coming to the rescue. The smaller vendors hungry for the business continued their attempts at getting her attention, the larger players decided to focus their attention on other more professional customers. Industry events fared no better with token attendance at best in a rare appearance; her company was one of the leaders and thus there was always participation by other functions in their relevant meetings. Unfortunately her team was also rarely found in such gatherings following the example set by her and the infrequent approvals for the same. The enigma lived on with resultant adverse impact on the company reputation and ability to leverage the innovation network that competition gained from. The two personas represent stark opposites with some exaggeration to bring out the differences; the former is not someone you find easily while many traits of the latter exist in the corporate world. Unanswered phone calls and emails – especially cold calls and emails – have become the norm for the busy executive who is largely running from one fire to another or shuffling priorities between the urgent and the important. This results in overcrowding of mail boxes with reminders and follow ups from the seekers. 1. Best way to avoid a meeting ? Don’t respond ! 2. Don’t want to do business with someone ? Don’t answer calls, messages, or communication ! 3. Confirm when someone is insistent, back out later citing urgent/important exigency ! The list can go on; in a hyper connected world, communication failure is rampant ! Respect for time is disappearing. What is the impact of this on corporate performance, cost of follow up, cost of waiting for others to turn up, opportunity cost, and finally individual credibility and reputation ? Politicking can kill not just projects, but damage enterprise value systems ! It was an opportunity of a lifetime for the newly appointed team of the entity formed as a joint venture between two behemoths; anyone would have vied for a part of the action, the team was handpicked with high performers in their respective fields. They collectively created an audacious vision for the project with many pioneering steps none of which had been successfully executed in the past. The endorsed vision required engagement of experts from various disciplines to be brought together for specific activities. Well-funded, they sought the best in each field to take charge of the tasks and forge ahead to fulfil the vision – a talking point within the industry. The best felt a sense of excitement at attempted the almost impossible, they came onboard easily; the energy of the team was infectious and recruited others with ease. Surprisingly the team of experts did not cross swords with each other and rather collaborated happily with each other, the glue being the leader and success that would deliver self-actualization. One such duo comprising strategic and operational excellence was on boarded to shape the systems, process, and technology, a necessary foundation for success. Both were industry legends in their own right, their collaboration was expected to bring the necessary magic required. They hit off well with the veteran providing experience to rein in youthful ambition and risk taking; the project thus took off with the industry amazed at the quality of inputs and discussions based on the benchmark beating framework conceptualized. Well and ill-intended pressure notwithstanding, the team delivered a path breaking schema at which everyone gawked at in disbelief. Global interest kindled, the battle was well fought among partners who wanted to be part of the now much discussed project. Surprisingly for everyone, the underdogs went on to impress the evaluation team to win the project much to the dismay of few sore losers who attempted to undermine the credibility of the winners; with time the pressure eased off and the team started execution. Emboldened by success, the organization retained the consultants for further definition of tech based projects, evaluation and award to thus selected partners. Transparent evaluation criteria was the hallmark of past success where aspersions could not be cast on any step or player; the second project too benefited from similar governance thus cementing the relationship between consultant and company. The industry applauded the partnership and spread the good news around for others to emulate. The organization had now got used to the best and success that came easily riding on the experience of the consultant. The third project of reasonable complexity had multiple solution possibilities and thus many providers who could have executed with varied degrees of success. Lobbying started from the inception and announcement with providers and integrators, big and small, pushing for change in specifications and dilution of qualification criteria, and leniency in the evaluation process to give a chance to every aspirant worthy only in their own eyes. Business team faced pressure; influencers of all types – good, bad, ugly – pushed the team to accommodate vested interests. They met the consultant, cajoled, threatened, and attempted every trick to swing the decision making criteria in their favor. Some of the changes were forced to accommodate additional vendors with clout with senior management and the Board. The consultant uncomfortable through the process, continued to work in the interest of the project and the relationship with the team that had brought success. The bids were finally accepted after multiple changes and timeline extensions; many bidders were beginning to lose hope smelling something fishy. The consultant remained tight lipped and started evaluation of the submissions and turned in his recommendations. After that days became weeks and months with no announcement as the partners hounded the Consultant for updates. Clueless he redirected everyone to the evaluation committee head, who steadfastly maintained that evaluation was still on. Unknown to the Consultant, the lobbying with the management had taken its toll; some of the new staff members were willing to bend the rules in return for favors. They poisoned the effort and proclaimed inadequacy of specifications as well as evaluation by the Consultant, recommending scrapping the project, which unfortunately was accepted. Aghast the Consultant exited the relationship which threatened to compromise the value system on which the relationship was built, and damage his credibility. It is evident what went wrong, some of which was controllable, and some probably not with vested interests holding power over decision makers. The collapse of the value system unfortunately polluted the rest of the enterprise which prided itself on its professionalism and lofty audacious goals that they had proclaimed, attempted and completed successfully. A year later, the company was looking no different from any other in the industry, the magic was lost and the high performers had moved on ! People build companies, people destroy companies too ! A new CEO came on board from one of the worthy competitors; he was hired to scale up and scale out in a market that was beginning to adopt the services offered by the company. His earlier stint was with a global mature enterprise in the same industry where he had grown the business as sales head and was now ready to take on the role of a CEO. The young industry required large teams to deliver onsite services to customers; technology did provide a differentiator where early adopters had seen the value. The CEOs newly adopted company had grown organically beating market growth but lagging behind on profitability, partly due to continuous expansion and rest attributable to operational efficiency which required technology interventions. To the CEO it was quickly evident that inducting new solutions would bring in the requisite process compliance and reduce exceptions which mostly led to costs going out of control; reduced dependence on individual performers would lead to the desired consistency and profitability. In the initial assessment he realized that corporate overheads were low and did not lend themselves to further reduction; he therefore focused his attention on investments required to bring in requisite technology solutions and thus tasked a small team of veterans to evaluate named solutions which largely comprised the universe of available options. The team rejuvenated with the new ideas from the newbie leader jumped into the evaluation process; industry research also pointed back to the same set of vendors. The solution providers – local and global – offered varied functionality that allowed for extension of services to be offered to customers; at the core, all offered basic process automation and customer management. The choice thus depended on technology stack, value added features, ease of use, customer and employee self-service, mobile deployment, analytics, and ability to deploy across the cloud as well as on premise. Flexible and conventional licensing models rounded up the full stack of evaluation criteria. Within the stipulated time, the team reverted with their evaluation and recommendation; they had done a fairly good job of mapping the existing business processes and identifying the best option for their company. They had also taken into consideration the company culture and primary decision drivers – low risk and cost; in the past the management had been hesitant to explore high capital investments instead preferring to work on low cost operating model where the plug can be pulled quickly to reduce losses. In the next Board meeting the CEO scheduled the proposal while the evaluation team stayed in the back of the room for any clarifications. The meeting started a bit late, and dragged on with the discussion on financial numbers taking up a large part of the day; by the time the item on the agenda representing the technology solution came up, the Board members declared exhaustion and to the dismay of the team present deferred it and other remaining items to the next meeting planned after a gap of 3 months. In the next meeting the Board did manage to discuss the project and asked the CEO to rework the risk return model as they found the outflow high. A Board member was assigned the responsibility to validate the final proposal and approve. Between the CEO and the Board member they kept at it for a while attempting to get the numbers down while increasing the scope of deliverables. In the interim business continued to grow and new customer acquisitions took away the CEO’s attention from the project. A short economic instability and the business saw a blip in performance diverting everyone’s attention to bringing revenue numbers back on track. The company continued the growth trajectory and the project was now on the backburner with all attention on further cost cutting to deliver Board mandated margins. The CEO attempted to revive the discussion on the value proposition and market competitiveness the company stood to gain with automation and technology solutions, only to be chastised for proposing spends in a lean period. Nimbler and technology driven competition overtook the company in market standing; the Board brought in consultants to create a business strategy that would help the company regain lost glory. Months later the Chief Consultant presented the business strategy for the next 3-5 years to full attendance from Management and the Board. The plan looked familiar and so did the steps they outlined for business efficiency and profitability; by the time the meeting ended, everyone looked at the CEO as an awkward silence prevailed. The plan and strategy was what the CEO had outlined with his favorite project that had quietly died in the hemming and hawing over the last few years ! When buying software, buy shallow, buy deep, but buy anyway ! Case 1: He got a call from head of manufacturing to quickly meet to evaluate their solution; surprised, the sales head rushed to the meeting taking the next flight available. The caller represented a large enterprise that had invested in much IT and this was a new opportunity; the solution was used by other industries, but not this one. The solution was niche with limited competition, the sales head knew that competition had not yet got a whiff of this; he landed in front of the team that included staff from IT and operations. The discussion unfolded with the articulation of the need and the business case around it. They acknowledged that the solution had traction in other industries, but they believed that as a pioneer much value could be captured if the project succeeded. Appreciating the forward thinking, technical resources were allotted to the customer to sketch out the detailed use case. Within identified constraints, the solution fit well though partially fulfilling the business case, the team pushed the vendor to provide a solution architecture. Back and forth they went refining the solution, steps that exposed the superficial thought that conjured up the project; as the urgency died down and the timeline continued to shift, the sales head lost patience, getting the short end of the stick on sales conversion of a purported hot prospect that had consumed significant time, effort and sales budget. The functional teams much wiser through the discussions had begun to like the specific solution; they however were unable to push the timeline for decision making. Months passed by, the aspirational go-live date came and went, the evaluation data exposed the shallow approach taken in their ignorance and lack of understanding of the complexity. They realized that they needed to revisit their assumptions, recast the timelines and budget to get it right first time. The smattering of smaller vendors who had engaged earlier had blinkered view of the elephant and solutions offered to address limited parts; unwilling to let go, the ally vendor demonstrated patience as the months stretched into a year. Case 2: In a high growth industry, the company was beginning to feel the pinch with lower than benchmark profitability. They were growing faster than the industry and at times had to refuse business as they could not hire fast enough or deliver service to customer satisfaction. They knew that technology could help their business and thus started evaluating local and global solutions. The business head after meeting a few vendors was confused by the choices, so a cross-functional team was put together. The team diligently evaluated options and as a starting point put in a part that appeared to be a low hanging fruit. The solution worked as designed but people ignored it citing operational hurdles. It was quickly parked in the technology orphanage and a consultant was approached to help in determining the best way to solve the problem. She recommended reassembling the cross-functional team to document processes, optimize and define the to-be process against which the solutions can be benchmarked. Supported by the COO, the team worked to create the document which was reviewed along with IT to formulate the RFP. The Group CIO put his hat in the ring offering to run the process with his trusted lieutenant who at best was better than average. The team would meet every fortnight to review progress made, tweak expectations and proclaim complexity larger than anticipated. The detailing of processes continued for the time period in which the consultant had proposed to complete the implementation ! As they approached the anniversary of project initiation, the team had evaluated multiple local and global solutions; the IT Head hired early in the evaluation had defocused from this critical project, now spend his hours in creating incremental technology solutions akin to Band-Aid. The business head wanting the best shot at the project continued to support the team which continued to refine the spreadsheet ad infinitum. The consultant occasionally followed up and realized that a decision was a moving target now. In both cases different factors contributed to inaction or no decision in the timeline that mattered to the company and the business. The first did not know what and how, the second procrastinated on the decision refining their requirements, solution design, and future, in an ever changing world. Both had different drivers and contexts, both ended up disadvantaged, the first losing the pioneering opportunity, the latter experiencing slowing growth and profitability. After a while it really did not matter if they finally got it right. It was a collective leadership failure ! Elephants can dance, but can they win a dance competition ? The company let’s call it A was the posterchild of the industry; they had grown faster than the market, had better margins, and a product portfolio that gave them higher traction with customers. The war chest thus created was used to acquire business interests and market expansion globally; the stock market rewarded them with benchmark beating valuations with a rare possibility of anyone catching up. The promoters kept tight control over the business and expenses with close trusted advisors – part of the inner circle. Investments in manufacturing excellence fueled the growth, quality was a way of life which enamored them to their customers. Practicing frugality in other areas, they perceived COTS to be uneconomical in comparison to home grown solutions. Thus they built a reasonably large team to recreate the wheel for every process, automation with custom built solutions for all areas of the business. While the industry adopted globally accepted best practices and solutions, company A justified its decision to stay different. Industry faced regulation in growing degrees making it mandatory for everyone to adopt technology based solutions for compliance. Auditors expected electronic trails and information as tamperproof evidence of process adherence. Major part of the industry prepared for and over a period of time gained compliance; the cost of deviation was adverse impact to business, and customer dissatisfaction. Industry norms demand compliance, so do adherence to country specific laws which is treated as a part of doing business. While major part of the industry simply bought solutions from existing providers and got done with it, company A tasked the IT team to build the necessary systems. Step by step the solution was built to specifications signed off by the business teams based on downloaded information from regulatory websites and second hand experience. Since they were building the basic minimum functionality, where technology was lacking compensating manual controls were put in place, deemed adequate for audit purposes. Faced with an audit during the phase of construction, company A demonstrated the scope of work and the fact that they were building everything required to make the process compliant. The auditors cognizant of the effort, accepted the input as work in progress and signed off on the timeline, to be reviewed during the next audit. Step by step functionality was put in place albeit slower than anticipated with parts of the business used to freedom and flexibility finding it too complex to adapt to the new way of working. Increased regulatory activity and deadlines with harsher penalties for non-compliance put the industry on alert specifically in some of the large markets. Cost of non-compliance was denied access to consumers until remediation fixed the gaps and there was enough evidence to demonstrate end-to-end process non-repudiation. The increased complexity of the new laws put the laggards in a precarious situation, especially ones who had custom built solutions which required longer time to validate. Vendors and consultants offered help to anyone willing to accept the problem and assist in putting together a compliant solution. Many global solution providers who had not explored niche markets by virtue of their size and cost of doing business, sensed a tactical opportunity to gain market share and grow the business. Leadership teams swooped down on the big targets including company A. Having survived the economic ups and downs with their own solutions, company A reluctantly agreed to the meeting. The CIO who was brought on board post the last large acquisition to drive technology led efficiency and transformation; coming from one of the leaders in technology adoption, he was seen as a good catch. The CIO with long industry background was aware of the problem and informed that they were on the way to solve the problem in the next 12 months – the deadline to be compliant. He did not believe that there was a need to press the panic button; deadlines do shift when it comes to regulatory requirements. After a couple of attempts at elevating the issue, vendors decided not to waste any more time in their quest to gain the business of company A. The CIO guarded the rest of the company executives to the upcoming challenge who were known to throw around their weight to get things done eventually, attempting to second guess the inner circle. The sycophant environment and the belief that we are too big to fail made them vulnerable to the upcoming date, their size made it almost impossible to breast the tape in time. Company A scrambled to the finish line partially ready, the business impact was significantly larger to the investment, attitude and inertia cost them a few notches in market standing. The CIO was fired for not elevating the issue and preparing the business; he had not taken the initiative nor involved other CXOs. Dip in profits and dividend crashed market capitalization, they had to fight hard to stave off an unfriendly takeover bid. Elephants can dance was a turnaround story, repeating history is not easy. When running against time, you rarely win ! Every industry has its share of regulations to which they need to comply; regulations could vary by geography or product within the industry. In a global economy this becomes important towards growth as well as the ability to continue doing business in a market. Enterprises have over a period of time set in a process to respond to changes in regulations which impact their profitability or revenue in any significant way; most compliances are driven by technology solutions driven by IT teams and thus making the CIO a key stakeholder. Compliance requirements are broadly of two types: the first one related to taxes and levies which apply in the operating market or country of origin of the enterprise. Companies have to comply to both and at times they can be complex and time consuming; applicable benefits and incentives also need to be factored in to get the financial benefit. Most large software vendors have modules to help their customers comply within the timelines; for custom solutions, IT organizations eventually get the process and timeline right. The second type of compliance is driven by consuming markets driven by protectionist measures or keeping in mind the interests of citizen consumers. Such requirements have a much wider impact to the industry and result in lobbying for and against depending on the impact. Such regulations or laws tend to have high budgetary requirements and need longer timelines to get the organization ready. At times they may impact core processes or make a market unviable to service, requiring a strategic decision to continue to operate. While the discussion started a decade back, in the last 5 years there has been impending regulation which required every company in that sector to comply to continue doing business. The timeline shifted a couple of times and then a phased compliance roadmap spread over 5 years was published allowing more than reasonable time to plan, execute and comply. The high complexity technology dependent process that impacted core business thus necessitated companies to go back to the Board to gain approval for budgets. This was a big one and had real impact to business; so Consultants, vendors, business partners and IT solution providers started discussion with their customers who needed to comply with the new regulation. Different companies reacted in as many ways; the early adopters listened to everyone, initiated a cross-functional team to review the impact and craft a program towards compliance while there is still time. They ensured that there is adequate time to get it right and make it standard process before the deadline. The second lot of companies took the wait and watch approach observing the early adopters, talking to the ecosystem who helped the first lot and then put together a program to implement solutions that have already been proven to work. They did not get early pricing benefit but took relatively less time to implement the solutions towards compliance in time; they could compare options from within the working set. Surprisingly between the first and the second set of companies they represented only about 60 percent of the industry. So what about the rest ? Did they know something the others did not ? Did they not understand the adverse impact of their inaction or failure to comply ? Was the problem not as acute as the industry touted it to be ? No exemption was available nor there existed possibility of an extension to the deadline. The group had enterprises big and small, multi-national as well as family owned companies and they were geographically spread thereby not forming any trend that could justify their stance of not taking action. Talking to a few of these companies, they fell into a few distinct buckets: the first who would do only the bare minimum to comply, and that is what they had done. Their decision making criteria was that why change until absolutely necessary. The second understood the problem and took decisions based on cash outflow, deferring until the last minute and choosing the lowest cost option. The rest of the rest were resting not necessarily fully aware of the challenge and the solution; some were surprised that many in the industry had already taken big steps. Who is ultimately responsible when a project (with IT dependency) fails to deliver ? Business had worked with IT to select the vendor who came with fairly good references and connected well with the team during the courting period. The CIO found the choice acceptable as the project was fairly straightforward and not much could go wrong in a project that was expected to last 4 months end to end. The CEO of the young smallish development partner took interest in the project with a large enterprise that promised more business in the future should this be delivered on time, budget and functionality. The project started well with meetings attended by IT, functional teams, and project manager from the partner extending into long sessions; the subject was discussed, debated and look at from all angles to make a better wheel than the wheel required. The scope document went through multiple iterations as the subject matter expert (SME) kept changing parts in every meeting. Keeping in mind the need to push ahead, the CIO brought back the team to focus on the business need and speed to get the product to market. The SME regaled in story-telling and kept the audience in attention with anecdotes unrelated to the discussion, hijacking the agenda and the project timeline. By the time the project was expected to complete, the team was just about getting ready for scope sign-off. Unfortunately other projects occupied the attention of the CIO which further pushed the timelines. Business had in the meanwhile moved on discounting the impact of the project; to compound the problem, the Vendor Project Manager quit. The team and timelines were recast with the signed off project scope and the development team got started; the first wireframes were a hit, and the UX fell flat, while the development team struggled to get the new and to them unknown technology stack to work together. Frequency of review sessions reduced as the project red flagged itself on the CIO dashboard. Startled though not surprised the CIO called for an all-hands meeting to review challenges and determine if it made sense to continue the project. The CIO and the vendor CEO decided to keep a close watch on progress; the solution was tested by the QA team and snag list identified for launch. The first field testing threw the team into a tizzy with UI that was unacceptable to the controlled group and bugs that surfaced. Speaking to the project sponsor, the CIO pushed the vendor and the SME to define the dates by which they expected the project to close. Both agreed to close the project within the next 10 weeks which appeared reasonable to all involved. As the time drew closer, the vendor escalated pending issues with the SME and vice versa making it an extremely trying time for everyone involved; it appeared that the project would never end while costs had also gone out of hand. It required drastic steps for the project to come back to relevance to everyone involved. So the SME was eased out of the project while all payments frozen until firm delivery dates were met with quality that was the selling point for the vendor during the initial pitch to the team. Another month later at its anniversary the project finally saw light and was launched quietly; it delivered success to the business despite some competitors having launched similar services. Much to the surprise of many, six months after the project was forgotten, the CIO decided to conduct a post implementation review to assess learning from the project to which he also invited the vendor to capture internal and external points of view, learning and accrual of benefits identified prior to project commencement. It would be easy to stick the blame on the SME who caused the initial delay, or for that matter on the change of vendor Project Manager; development quality and testing could be touted as one of the causes or the fact that the technology stack was a new one ! What about bad UI or UX which would have been a disaster if launched ? CIO or Business Head not giving it enough attention or as many would say lack of leadership ? Did it matter as the project delivered value and everyone was happy in the end ? It mattered to the CIO who meticulously documented the milestones, challenges, frustrations, and put them across for the group to review, sleep over and come back with their assessment. A detached view gave everyone the perspective of individual shortcomings and collective reasons for the project delay and the predicament that everyone experienced. The Organization was richer to the learning which raised the bar for future projects and institutionalized the Post Implementation Review process. What happens when your CEO chooses an IT vendor without help from IT ? The company was on the way to recovery after management change which decided to renovate the business and bring it back to relevance to new customers at their terms; products went through a facelift and upgrade to appeal to the younger generation of consumers. The forgotten sleepy company thus began their journey into the big bad world of Digital customer engagement, ecommerce, and compete with the old and new age companies who had already gained mindshare and market share with a head start. The new CEO had some success to his credit of having turned around ailing business; in his no nonsense style he reviewed and made appropriate changes across various functions inducting fresh talent where required. As a part of the transformation he also endorsed technology enablement of company operations which was executed successfully by the new CIO. Everyone aligned to the vision of the CEO who took decisions swiftly, leveraging old connections and partners from the industry who had worked with him. With aspirations to make a dent in the global market with digital commerce, he tasked an old friend and known marketing guru with much acclaimed success of having turned around the fortunes of flagging brands a few decades back. Bringing him out of semi-retirement, the CEO believed that he would be successful in the new age too. The old man acquiesced to the request and used it as a launch pad for his struggling digital practice run by the next generation; the project was signed off with broadly agreed scope and timelines. Months passed quickly as they progressed on the journey with Marketing taking the lead of the new business opportunity. Working with the vendor and market sales team, the HQ Marketing team created a market communication plan, collateral, outreach and activation program, while coordinating with other teams to come together to launch the business. It is then they realized that integration with the new IT systems was critical to launch and sustain the new business; so the CIO was inducted into the group. By this time the initial deadline had already passed and the CIO was asked to rush through system integration and not delay the launch. Apologetically he agreed to expedite the task and traveled the extra mile to understand requirements from the vendor and provide the necessary help. As meetings progressed, his antennae buzzed that everything was not hunky dory. He dug deep and wide to realize that they were hurtling towards eventual Armageddon with no signed off requirements, project plan, and skills of the developers. Subtle shift of responsibility, the CIO setup project governance, requested weekly updates that reluctantly started coming as the second deadline passed. Marketing happily deferred to the CIO to take lead in fixing the broken and achieve success; the CEO was apprised of the situation and that the project will slide some more before recovery. Surprisingly, the CEO accepted the status without too much protestation and asked the CIO to keep him informed as they progressed; he justified the potential debacle as a calculated low cost risky experiment. The CIO intuitively knew that the project will not be able to deliver to expectation if it continued on its current trajectory. Taking external help he educated the team about best practices and what can be with the right set of resources; The CEO unwilling to accept the mistake of having chosen an incompetent vendor continued to push on; he was unable to go back to his old friend to shift the project to an alternative vendor. The project thus continued to flounder for a while, the business losing the opportunity as a result. This situation of the CEOs pet project continues to haunt companies where decisions are taken based on comfort and past performance even though unrelated; in many cases convenient scapegoats are found. Almost every CXO steps outside their competency to demonstrate value addition beyond their roles, many times with detrimental results. Corporate politics unfortunately does not allow open debate on these matters; power centers get away with suboptimal designs and strategies leaving the organization at loss. It requires strong leadership to accept a mistake and equally strong leadership to challenge the situation before it gets out of hand. C level teams rarely get into confrontations preferring to be nice to each other and loud mouth managers take advantage of this state of affairs. “I am here to be effective and not popular” was a quip I had heard from one such maverick leader who had taken the company to new heights. Everyone loved him as he bonded the team together on sustained success that he brought to the company. Fatigue is setting in on Information Security scares, a darker future ahead ? Another site hacked, millions of user credentials compromised ! Zero day attack discovered, patch on the way ! Ransomware is getting smarter, stay alert ! Everything having an embedded computer or chip is vulnerable to potential attack especially if connected to the Internet. Compromised software, backdoors, unchanged admin passwords, shared identities, complex every changing passwords written down on pieces of paper, the number of ways in which we are being exposed is increasing every day. The information security bogey is breathing down our neck every minute while we wonder where the next attack with emerge from to compromise our identity or steal from us. Every company going Digital is exposing information to the Internet; strategy varies by company and implementation, but the fact is that now information is available on servers that are facing the public and thus will be targeted. IT organizations and vendors tend to live in their self-proclaimed paradise, smug that they have taken adequate steps to protect themselves. Most of believe that if there is no evidence of leakage or compromise, then I am protected and do not need to worry about the changing threat landscape. IT departments are under constant pressure to keep the information assets of the company secure and ensure safety of data residing in various machines, removable media, data in motion, and also address phishing attacks on customers using their domains, as well as employees clicking through on spam. Protect the gullible, irresponsible, and naïve who refuse to learn from training programs and past mistakes; at the same time provide access to information on mobiles, via internet cafes, and public wireless hotspots. Device management, network management, VAPT (Vulnerability Assessment & Penetration Testing), firewalls, anti-virus, DLP (Data Leakage Protection), log management, SIEM (Security Information & Event Management), patch management, hardened devices, VPN (Virtual Private Network), multi-factor authentication, identity management, IDS (Intrusion Detection System), IPS (Intrusion Prevention System), Automatic malware detection and analysis, Anti-adware, WAF (Web Application Firewall), the list of tools is almost endless. All these pieces or combination have to work together to make the enterprise safe and protect the extended ecosystem and staff. The information security organization struggles to educate and protect the digital assets of the company while consumerization of IT keeps creating holes in the fabric. Everyone wants email access on phones and enterprise apps on the go; the same phones have all kinds of apps downloaded from public app stores snooping around; containerization is still new though evolving. Employees, especially senior management desire flexibility to additionally access corporate applications from their home computers which are not under the corporate security programs. Increasing touch points increase susceptibility; the CISO has to work hard keeping under control the complex jigsaw which threatens to collapse regularly. Organizations are reaching a break point wherein they are now working on acceptable risk models rather than fix every piece that is broken or likely to be threatened. Let some fires burn ! Most companies live in the perception that targets are normally the visible and high profile companies rather than the small, relatively unknown, obscure or insignificant websites and portals. DDOS attacks are launched only when there is commensurate gain; hacking attempts are made only on digital assets of value or high visibility. While this may be relative truth, reality is that no one can afford to be slack in their preparedness or live in a fool’s paradise that as a low profile non-entity they are safe. In most large enterprises, security budgets have been steadily increasing to the point that they are now being managed independent of IT. Business expects periodic feedback on information asset security and action being taken by competitors; Boards want answers on risks to business, market, and reputation in the digital world. The bogey of security is no longer adequate to get budgets sanctioned, they need clearly outlined business case, risk profiling, regulatory compliance for some industries, ROI, and connect to business outcomes. News of breaches today have become less sensational with people accepting the fact that some will get compromised while the majority will stay safe and a few will not disclose. In most cases the root cause analysis indicates human oversight, error or not following the basics resulted in successful attacks with majority being internally motivated. Complex and high tech attacks target (pun not intended) easy pickings on financial and personal data that can be used for monetary gain, or are orchestrated by state actors. Don’t let fatigue defeat you, stay awake and alert, the complex digital world increases dependence on technology and there are no choices to make ! Technology changes the game, customers change the rules ! In the early 90s, the initial days of email it was fashionable to have a personal tag line at the end of the message over and above the signature; it used to be a famous quote or a witty one liner that represented the persona. Unaware of the profoundness of the statement as a youngster I had the following going for almost 5 years: “My interest is in the future, because I am going to spend the rest of my life there”. I don’t know the source from where I picked it up as it was before the advent of the browser, contemplating it now feels awkward ! The future is here and how ! We aren’t done with technology evolution, we keep anticipating new disruptions and welcome them. Technology disruption over the last century or more started with electricity and then continued with transportation and electric appliances which change the way we live and travel today. Today when we think of technology and its power of disruption we think about the last two decades and the impact they have had on us and business with disintermediation and customer engagement. A famous venture capitalist and Angel investor once wrote about “Why software is eating the world” which outlines the technology led disruption to almost every industry. Old and even new economy companies have been threatened by software evolution and software led disruptions. The concept of software is applied in a broad sense with computers and related technologies being clubbed. That does not in any way reduce the impact technology has created across industries as captured by the author. Mobile phones have been around for a while now and so have smartphones; but the newer devices are stretching the limits of compute in our hands thus providing enterprises new ways of engaging their customers. Be it services or products, every company wants to use the primary consumer device to push all kinds of notifications, track locations, access contacts, store cookies, at times to the extent of becoming a pain; today almost every service is available via an app and so is every fathomable product. Multitude of channels bombard the customer from physical to digital to mobile assaulting the senses through the day and night. Every visit to a website, an app opened, store visited, mobile wallet used, credit card swiped, destination searched on maps, every action leaves indelible bread crumbs which are picked up. For the customer fatigue starts setting in when gamification offers freebies in return for action once again creating a short lived surge of activity while everyone catches up to the game with me too offerings. Every person has a trigger point, some short where consumers don’t tolerate anything that is not aligned to their interests; they research options to shield themselves from the barrage and shut off all possible triggers they can and broadcast these to their circle to follow suit; activist behavior marks this segment of consumers who love to be served at their terms and are cautious of their privacy. They are opinion leaders and shapers who people listen to and take action because it feels right and good. However, the majority tend to maintain status quo while being subjected to all kinds of incitement, and at times irrelevant messages; the effort to change appears high and thus inertia keeps them going until an incident – direct or hearsay – provokes them to take action. This segment is tolerant to being hounded ignoring small indiscretions thereby once again landing in the same state from where they started. They play the game with their brands of choice until they become tormentors and fall off grace only to be replaced by others. A minor and growing segment plays the game becoming the protagonist to beat business at their own game. They know how to exploit the system, get best of deals, hack into models to find value and distribute to whosoever may be interested. Predominantly millennials who love the technology connect and take disruptions in their stride. At times they are the source of ideas that send shivers down established conventional business entities. They are inventors wanting to change the world and thus lead change in the rules of engagement ! It is unimportant to enumerate the list of disruptors and the disrupted across industries, the most talked about being the hospitality, transportation, photography, music and music distribution, gaming, media and advertisement, logistics, education, healthcare, the list goes on. Every new idea gets copied to death threatening the original and at times succeeding in uprooting the innovator. Customer expectations continue to change as they love the adulation of the wooers who compete for the same segment. Keep innovating, stay hungry, stay connected ! The company was a pioneer in adoption of technology for a long time; this was facilitated by a visionary business leader who believed that IT will make the difference when every other aspect of business had been copied by competitors. Thus he pushed the enterprise to invest in technology which none in the industry had deployed; they did not succeed all the time, but he continued to push on, challenging not just the business team, he also nudged the IT team to take risks and come up with new opportunities to grow the business. As the company grew, so did competition expanding the market as well as taking advantage of newer technologies. That did not take away the advantage of process and technology maturity from the early adopter; with new leaders taking on the primary mantle of business, they however did not pick up pace that was necessary in the face of new paradigms of business. Leadership change made decision making shift to lower risk model for new projects and doing more of what made them successful in the past. A shift occurred when a new CIO was hired to replace the exiting IT leader who had lost interest due to change in organization dynamics and the fact that he had lost connect with the business. With the new came wave of expectations; he got off the ground running and had the IT team charged up with his collaborative approach. Business also loved his connect, can-do attitude and the ability to get things moving; he established credibility with projects that were deemed difficult and path breaking in the industry. The project was neither innovative nor first for the industry, but its scope impacted the entire business and company reputation. The CIO worked with the business head to present the case to the management and then the Board. They were given an in-principle approval but with a low-risk caveat attached to keep investment to the barest minimum. Even if it does not work, we will not be too much out of pocket. So the investment schedule was changed along with the solution to adapt to set expectations. Since the project required cross-functional collaboration, they had difficulty in aligning everyone to the goal which stretched timelines and budget a bit. Coaxing and cajoling the non-believers, they managed to get off the ground and launched the new business. Ramp up was slow and steady as business slowly found traction with customers; the peak during the following festive season broke the process as they faced the ire of customers and internal teams who were stressed by the additional workload. Learning from the incident, root cause indicated the nonchalant behavior of the unaligned as the primary reason. The CEO unwilling to acknowledge the failure by the business team blamed the technology and implementation partner seeking a change to an alternative solution. With no recourse, the team reluctantly moved on to evaluate a better system which would help them scale up and also meet expectations; the caveat remained this time around also, do more with less, we cannot invest too much. Usual project travails and a year later, the new system found light of day; newer technology comes with new features which were expected to provide better capability to the business teams. Some of the non-believers converted and joined the wave which made good addition to their resumes. Since the root cause was not fully addressed, the next big surge created problems of larger proportions, also impacting the brand apart from loss of business; the ostrich CEO fired the team and decided to go to market again for a better solution ! The new team wiser to history took cautious steps towards selection of the new solution going with global leaders, unwilling to try any other approach. They patiently waited for budget approvals and the cross-functional team to be formed that would drive the project along with the technology team. They chose the best of implementation partners, collectively turning it into the mother of all projects for the company. With the large budget the CEO was under pressure to deliver the project right third time, the Board demanding results. From the first attempt to the one now, the gap was close to a decade; competition had risen with the waves, many had fallen too. Customers had evolved expecting better experience, service and bargains. Changeover took some effort, the new platform was deployed with new capability and expectation of higher business. The large investment rankled somewhere, the Board expecting commensurate returns in a fast growing market. The business teams continued their other lives while the platform struggled. Internal process alignment, market dynamics and customers finally decide success; the CEO was heard blaming the tool again ! Dear CIO, Don’t just align, be the business ! More than two decades back starting my life as an IT leader, I had aspirations to be an industry first and transform the company and leverage the then technological innovation – the “Internet”. Consultants and vendors joined the rising crescendo – if you are not on the Internet, your survival is at stake ! FUD created by Y2K threat was a welcome diversion for Glasshouse dwelling IT. Neither the Internet nor Y2K lived up to the disruptive promise; the subsequent squeeze on budgets did challenge IT Heads to change the paradigm. Driven by technology evolution, the IT function transformed itself into structures with centralized, federated and other models of governance. The CIO was advised to “Align to Business” and get out of the ivory tower; frameworks offered help to the challenged, smarter ones declared themselves aligned with self-assessments. IT created demand and supply organizations to address the needs articulated by business and IT projects shifted to being jointly owned by business. The harmony however did not last too long. “Be a Partner” became the new mantra, necessitated cohabitation of Business and IT teams and clearly defined business accountability for IT enabled projects; Business Relationship Managers were implanted across. COTS, Self-service and Cloud created opportunities to dismantle legacy as business loved the new mobility solutions that created new opportunities to engage internally and externally. Internal structures and cultures did challenge many while breakaway groups became beacons of success much written about and to be emulated by others. Martha Heller in her new book “Be the Business” has captured journeys of many Rock Star CIOs who lived their journeys – with or just ahead of the hype curve – validating some of the theories built around their modus operandi and success. 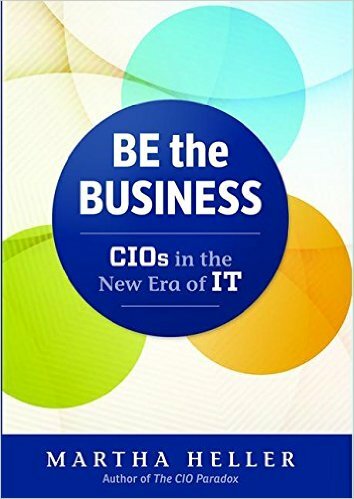 Assimilating these into almost a step by step process, the book makes great reading for existing CIOs to benchmark and make adjustments as required. Aspiring CIOs would do well to use the text as a guide to shape their behaviors as they get ready for the seat on the table and not behind it. Interspersed CIO experiences ensures that the book is not prescriptive in disseminating pointers and tips. Martha offers that CIOs should take the bold step and risk to fill in gaps in the ever evolving technology landscape which keeps throwing demand for new competencies and capabilities fueled by every new buzzword. She goes on to dismantle the fad the Chief Digital Officer became and how CIOs who seized the moment grew into larger business roles while retaining their technology foundation or passing the baton. The “iceberg” of IT first acknowledged in the early part of the century makes welcome refresh for large IT budgets struggling to keep the lights on or business as usual. Dismantling icebergs is a complex process and requires continued support across the enterprise without which the CIO finds it difficult to create change. Real life examples validate the need for holistic and structured approach to change and becoming Change Agents. They echo my journey in a few organizations; I wish I had the benefit of the learning available now to readers. From the famous “IT Doesn’t Matter” by Nicholas Carr, the CIO has come a long way with business gains from automation, disrupted a few business models, co-innovated to create new products and services. Traversing the milestones I find the book easy reading with insights that offer models for CIOs to improve their success rates as they lead from the front and work in sync with business teams. As a veteran CIO blogger, I find the content resonates with my experiences and complements the learning. Being part of the CXO team is a privilege which comes with its own set of management complexities; managing peer groups, measuring business outcomes and cascading them to the IT organization requires deft handling and setting expectations. The CIO is expected to create interventions that cut across silos while helping each functional head win their battles while the war needs to be won by the enterprise. Being the business is an equal task for the CIO who needs to keep the technology roots strong while being an equal on the Management team/Board ! Get off from your comfort zones, take a cue from the leaders who made it, your own destination and journey could inspire your teams to excel. The book is worth the investment. Internet of Things is invading our lives in many more ways than we can imagine ! Industrial sensors have been around for a long time providing data streams to measure effectiveness and reduce breakdowns in assembly lines; these specialized solutions over the last six decades apart from automation helped faster, better, cheaper production. A score years later RFID created new possibilities with anti-theft in retail, toll payments, building management systems, supply chain track and trace, and identity management with smartcards amongst other use cases that has sustained interest in the technology. Another two decades passed for the advent of what we know as IoT which in the initial days had imagination run wild on use cases and potential; auto-replenish refrigerators, trashcans and garbage bags posting to social media on what you consumed, it has been a wild ride for dreamers and thinkers. Two decades later, price and technology improvements have started shaping some of the whacky ideas into reality. The possibilities are exciting and scary at the same time with traceability resulting in loss of privacy for individuals and society. Today almost all of us are being tracked by virtue of our presence on the internet and mobile phones we carry; almost all websites now what to send notifications across devices, track our movement, maps store data of directions we ask for and travel we complete; loyalty, credit and debit cards store transactions creating personas that would probably scare the hell out of us. Finally our fitness bands and smartwatches gather vital data that can influence our insurance premium, healthcare costs and medical profiles. Current hype is all about transportation which has already seen aggregation and disintermediation on a large scale globally. Add autonomous to that and suddenly it starts impacting a large number of ancillary industries as the world moves to conveyance as a service. No more car loans or insurance, or scares with crude prices fluctuating, or breakdowns; no worries about parking slots at work or when out with friends or shopping; no traffic violations to worry about, toll payments, or upgrading the car ever so often. The most beneficial aspects of Internet of Things come to life with Smart Cities where the number of use cases keeps increasing. Smart energy management, traffic monitoring, water management and leakage detection, waste disposal, and citizen services. Protection of energy grids or control of emissions and gases, and monitoring, surveillance of public infrastructure, law and order round up the IoT enabled services. Smart Cities also promise ubiquitous wireless connectivity to offer services and track tagged individuals. Another benefit that the industries across have garnered is in temperature controlled logistics; food chain definitely benefits from IoT enabled trucks and vans, the bigger beneficiary has been the healthcare industry with medicines and pharma products retaining efficacy when transported and stored in defined controlled environments. The industry has boomed with the availability of efficient and reusable technologies that now dominate across use cases; though a decade after the world’s largest retailer mandated use, unit level tagging still to take off. Irrespective of industry, IoT promises to provide new found opportunity to improve internal operational efficiencies or the way customers interact with the company. Industry wise use cases are plenty with Consultants willing to provide useful to harebrained ideas. Startups are also beginning to impact this space with innovative technologies and use cases that challenge conventional wisdom. The challenge to enterprises is to weave these into the exiting organization fabric without disrupting business as usual. Symbiotically linked to mass adoption of IoT is the ability to analyze and mine insights from the vast pools of data that is flowing in with ever increasing speed. Our ability to store and analyze data has kept pace with the data streams that threaten to flood storage space if not managed effectively. The ability to separate the real stuff from the noise will differentiate the grades of success enjoyed by companies and their customers. Newer data sources and correlations make better actionable insights fueling the IoT wave. It is contingent on business and technology teams to continuously explore new IoT technologies and use cases; the potential to disrupt is not always obvious at face value. Driverless cars will put out of earning more than a million people directly and many more indirectly. Smart energy sensors have already started slowing down the increase in energy consumption; IoT has also improved efficiency factors in linear production facilities and warehousing. Smarter, cheaper, and relevant is the way for IoT to keep everyone on their toes. Don’t sit on the fence, start exploring, keep in touch, stay connected, IoT is all pervasive, use it ! Blockchain is here, where are you ? Bitcoin has revolutionized the financial world with almost every bank, insurance provider and financial institution taking initiatives to understand the impact of the cryptocurrency and purported disintermediation of sovereign currencies as we know it today. Just a couple of years back, the big crash of the most sought after virtual currency led to the emergence of alternatives that have gained favor of cybercriminals and the likes. Today there are interesting startups leveraging the underlying technology for various use cases in the real world. Skyrocketing valuations of these startups offering lending services threaten to take away the conventional business of banks who thrived on arbitrage between the borrowing and savings pools. It is forcing banks to review their centralized model of managing information, settlements and transfer of deeds. Other industries are being pushed by FUD factor to incorporate blockchain somewhere within their technology landscape; experiments thus far have not provided clear use cases on how they can benefit. With limitations on physical scalability of any business, CIOs and CDOs are being pushed to create non-linear scalable architectures to support networked business models for the future. Disruptors in transportation and hospitality space have given impetus to other industries to get out of the box and engage in network centric thinking. It is moving away from infrequent sales or provision of services to an asset lite subscription based digitally enabled models co-created by customers, fueled by big data analytics. Simplistically blockchain is a cryptographically secure tamperproof distributed set of blocks organized into a database or ledger offering non-repudiation and immutability for any transaction. Implementation is complex involving a network of nodes created by public or micro-consortium, which may be geographically distributed across political boundaries with limited jurisdiction by governments and enterprises. Thus cryptocurrencies are the first choice for anonymous transactions as no central authority tracks or has the ability to track ownership data. Stock markets, smart contracts, authentication data on copyrighted material or physical goods tagged with data verifying its source by recording milestones of its journey are some of the innovative experiments using blockchain. Some global companies have started experimenting with the security features with protection of assets of national interest like power plants and distribution networks, clean water supply, and finally creating a digital trust network enhancing existing solutions like federated PKI. Experts and Insiders have always dismissed disruptive opportunities, starting from the horse-carriage, Personal Computer, mobile telephony, Internet, and the smartphone ! This time around the rapid evolution and rise of blockchain’s most popular implementation Bitcoin in less than a decade including falls has brought this technology to everyone’s attention. Money is chasing opportunity and none dare conservative predictions on the potential future impact or ignore its disruptive nature driven by increasing global interest especially in Fintech. Can retail industry embrace blockchain in the as yet evolving omni-channel world providing trust of authenticity and guarantees to the customer ? Is it possible for manufacturing to move away from low cost mass production to unit level customized products assured by blockchain delivered to consumers with flexible manufacturing and 3D printed products ? Can distributed information using blockchain change the way information is stored, consumed and protected, allowing only rightfully permissioned access ? The question remains when blockchain will see the S-curve of that most technologies see after initial trials and tribulations. The charge needs to be led by technology leaders considering the not so simple nature of implementation; it was heartening to observe a group of CIOs who have already started dabbling in cryptocurrencies and how it could if at all impact their respective industries. Another group hit by ransomware was forced to figure out payments using bitcoins, one of the popular cryptocurrencies. Beyond the Proof of Concepts, I believe that enterprises need to create cross-functional teams from compliance, risk and internal audit to assess impact on internal process and customers. Blockchain benefits accrue within groups or micro-consortiums participating together; however large groups can reduce collaboration effectiveness and decision making. Speed of execution still remains a challenge with blockchain; having said that technology is evolving rapidly to bridge the gap from current transactional technologies. Reality is Blockchain will become mainstream sooner or later; where are you ? For every industry regulatory compliance is a given with no exceptions; these are local to the enterprise home country or in the markets they operate in, and dependent on products and services. In such situations there is always a choice of vendors who offer solutions to solve the problem at hand. These vary from local providers who grow with the industry and tailor their offerings to evolving needs; and then there are global providers who offer deep and wide solutions for large enterprises. The conversation started by stating the problem the industry was facing and how it was expected to impact revenue and profitability in the near term followed by the standard sales pitch on how they were better than competition and why the assembled companies should consider their solution. The audience comprising of potential customers represented by CIOs, IT teams and few business folks agreed with the problem statement in varying degrees based on their frame of reference and charted journey which was their reality. We started working on the problem three years back with the Board endorsing the strategy and approving the investment. We have almost completed the project and are now auditing what we have done. We comply with current requirements and are ready for the upcoming regulations deadline. We welcome your team to review our current state of readiness and highlight lacunae if any so that we are sure of our status. Please ask your teams to get in touch with me so that we can work together on this initiative. Our business operations are not very large in the markets that require compliance to upcoming regulation; they have scaled down a bit in the last year or so due to some issues. We did start a couple of years back and took a step by step approach to solving the problem; my colleague here leads the initiative. There are a few gaps in our current readiness and we would be happy to explore your offerings to evaluate the value proposition. Let’s connect back after a few weeks and take the discussion forward. Local vendors have given us the solution that complies with current requirements; they have offered to continuously develop the product based on evolving needs and deploy when we want it. Our Management has taken a decision not to deploy any solution until absolutely necessary. My team leader would know the exact status, I am not aware of the details; I will speak with them and revert on where we are in the journey. Once I have the status, I will reconnect if there is a need; in the meanwhile send me some information. Three different perspectives from seasoned CIOs, each had spent over a decade in the industry; their respective companies were market leaders and competed fiercely with each other. Their journey towards compliance were spread across the spectrum with varied strategies and solutions – local and global. What was surprising though is their level of involvement, understanding, preparedness and attitude to critical business process that could adversely impact revenue, market share, and profitability. The conversations also depict domain expertise and connect within the enterprise to the business and its challenges and opportunities. The first company is clearly a leader in usage of technology which the industry also hails. The second has experienced some trials and tribulations which has left the company losing market share, profitability and reputation. Progressively you will surmise that the last would be in the most disadvantageous position ! At least not at the moment, though their current stance may result in such a position. Gigabytes have been written about the evolving CIO, role, opportunity in the digital world, CIO 3.0 and what have you ! CIOs have also been threatened by disruptions and the opinionated passing judgement on their future. The role has survived, evolved and many have thrived; unfortunately with the multi-dimensional nature of rising expectations, the numbers are beginning to dwindle. It is not that CIOs have lost touch or ability to make IT work, it is just that they are not in a position of influence when it comes to business. Leaders are expected to not just make a difference internally but also be seen as beacons of light for others to follow; they need to shape opinions and outcomes for the industry while leading from the front. CIOs who achieve this are the ones that get written about in magazines, have case studies, and are seen in seminars and conferences on the dais, while the rest make up the audience. I believe that the true CIOs will continue to forge new paths while the rest of the industry will wait for early adopters to follow. Where are you in the journey ? How can you expect returns if you are unwilling to invest ? Business is hurting from the lack of the right tools and enablers, we need a good dose of IT to create efficiency. We acknowledge the need to transform and that is why we are talking; the team also agrees with the direction and the way forward. The benchmark results are well received and we would like to be in the top quartile of the industry. We should create the framework for evaluation of options to our specific requirements before we finalize on the best option and let’s work to an aggressive time line. The CEO intuitively knew, to take performance to the next level, technology has to play an important role. Coming in of global competitors had started slowing growth and put pressure on profitability. Operating margins and other business metrics were lagging behind; survival was not at stake but to stay relevant to major customers, the business begged for technology. The absence of mature IT leadership posed additional challenges in execution of the strategy defined through a technology consulting engagement. Early investments in technology solutions had not delivered to promise; early decisions were taken by the business based on promises made by vendors on business benefit. Business participation in the project waned quickly as technology formalized processes and exposed lacunae in operations. People on the ground resisted the change creating roadblocks – real and imaginary – towards deployment. The cycle repeated itself a couple of times leaving everyone frustrated and wondering if technology will ever deliver. That was before global players invaded the market changing the way business was done, improving customer satisfaction and driving profitable growth became an urgency. Even with higher overheads and manpower cost, they delivered; in came Consultants offered a mirror to the business and helped them with a well-crafted plan and strategy; technology strategy followed. A new CEO added to the excitement with experience at competitors. Culmination of events necessitated that the company reach a decision rather quickly. In a perceivably low margin business where the average margin was half of the best, it was evident that operational efficiency can gain significantly with the right IT interventions. Industry specific solutions and generic options competed on functionality and price with a wide variation in between. An all hands meeting agreed to the strategy and initial steps enthusiastically committing resources and time. With negligible investments thus far, in parallel the Management decided to approach the Board for budgetary approvals. The Board members had diversified business interests with business operations of varied size; they were also parsimonious in their approach to investments especially technology which was seen as necessary but not essential. Thus while their companies had grown in size and reputation, they had not been able to realize the true potential while newer competitors had moved ahead. The minnow in the family thus started from a disadvantage when the CEO put his case across for investments in technology. Discussions went back and forth on various technology options, merits of one over the other, cost of acquisition and support, TCO (Total Cost of Ownership) and business benefit; the figures appeared obscenely high even though they were competitive and in line with benchmark investments. For the Board reality was that other larger entities in their bouquet too had rarely invested similar amounts barring the initial stages for industry standard ERP solutions. They finally approved a significantly reduced number which turned the project into a non-starter. The business case was clear in identifying the benefits – financial, customer satisfaction, growth, profitability – the ROI was less than a year; but past experience made the Board wary of committing to the investment. Ensuing “What if” had no answers beyond a point; there are no certainties, only probabilities of success. The sanctioned budget did not cover basic costs even if executed in phases to demonstrate potential success. Risk mitigation strategies can be created for most action plans, the keyword being “action”. Except in cases of some of the new technologies and innovative digital models, most of the solutions – vertical or horizontal – have successfully established credibility to deliver business value with discipline of execution and leadership oversight and endorsement. Phases can reduce risk if logically broken down with continuity in the journey. Processes if left out of design consideration will fail to provide the end result. Analysis paralysis can miss opportunities that become clear only in the future, status quo breeds mediocrity. Years have passed since the above happened; they are still at the same milestone the debate continues, they are yet to decide and the industry continues to grow rapidly !